Memory out of control? Tame it with MemoryTamer! 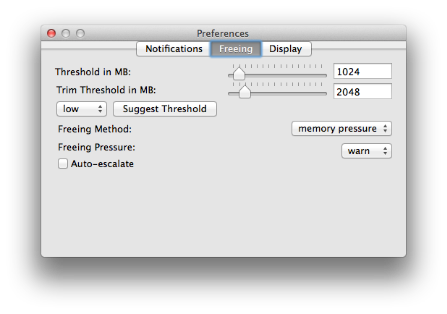 MemoryTamer is an automatic memory-freeing app that runs in your menu bar. 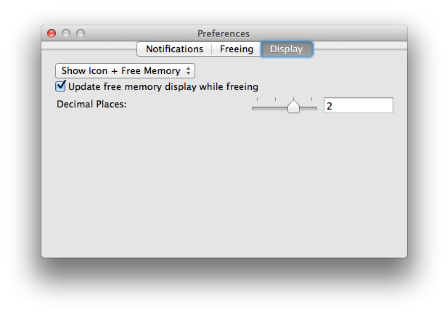 It supports notifications with both Growl and Notification Center (on supported versions of OS X), and also lets you free memory whenever you want with the "Free memory now" menu item. If you find a bug, have a feature request, or need any other form of support, you can contact me at eric@memorytamer.com or via the built-in "Provide Feedback" form under the "Support" menu in the app. Each license code should be usable on up to 3 computers. If you have reached this limit in less than 3 activations, please contact me at eric@memorytamer.com and include the license code you have and how many computers you have activated it on. If you have more than 3 computers, I am willing to offer a 50% discount on a second license code. Additional license codes beyond the second will not receive the discount. Contact me at eric@memorytamer.com to request this discount. You will need to include your existing license code. * Depends on settings and not guaranteed. 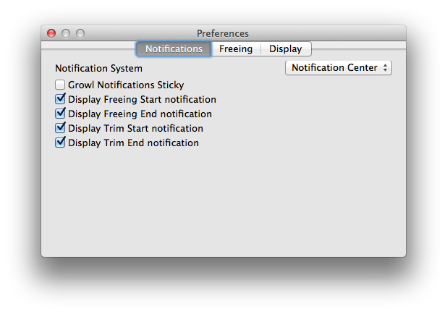 Default settings on Mavericks should do this.